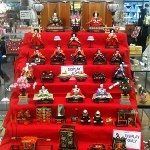 Hinamatsuri is a special holiday in Japan, that is celebrated on March 3. This holiday is sometimes called Doll's Day of Girls' Day. Hinamatsuri has old customs, that were born during the Heian period (794-1185). At those times people believed, that the dolls possessed the power to contain bad spirits. Setting straw hina dolls afloat on boat and sending them down a river to the sea would take down evil spirits and troubles with them. The tradition of sending hina dolls afloat on the river is not practiced any more, because the dolls are caught into the fishermen's nets. Instead of this the dolls are sent directly out to the sea, and when spectators go away, the boats with the dolls are taken out of the water and brought to the temple. There all the dolls are burned down. Traditional dishes are made to celebrate Hinamatsuri festival. A customary drink is a sake made from fermented rice. The bite-sized crackers flavored with sugar or soy sauce (hina-arare), diamond-shaped colored rice cake (hishimochi) and sushi rice flavored with vinegar, rice and topped with raw fish (chirashizushi) are often eaten on this day.